The world can be tough on your eyes when you wear contact lenses. 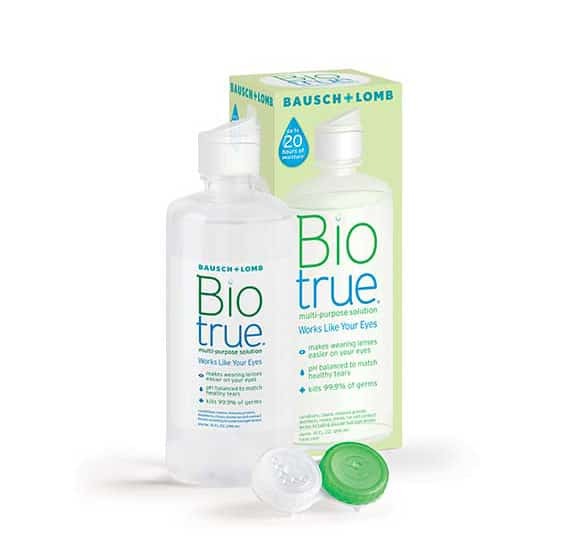 Biotrue multi-purpose solution helps make wearing contact lenses easy on your eyes.1 Biotrue is easy on your eyes because it is formulated to work like your eyes. Contains hyaluronan (HA) – Biotrue hydrates your contact lenses in the same way that your eyes naturally hydrate – by utilizing hyaluronan (HA), a lubricant found in your eyes. Same pH as healthy tears – Biotrue matches the pH of healthy tears and enables optimal performance of the dual disinfectants. Beneficial tear proteins – Biotrue keeps proteins in their native state active as they are naturally in your eye. They act as your eye’s inborn germ-fighters. Up to 20 hours of moisture. contact lenses, as recommended by your eye care practitioner. To guarantee that our liquid lens care products are always sterile, this item is final sale only and may not be returned/ exchanged. Thank you for your understanding. Check out our return policy here.